I don’t get out to the Oregon Coast nearly as often as I would like to, but I managed another trip before the year comes to a close, and once again timed it just right for some beautiful weather. It was actually warmer than my November trip! 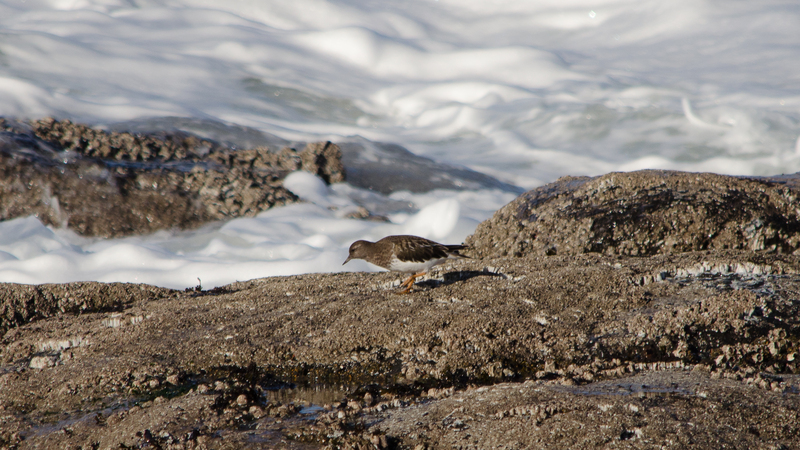 The best birding of the day was around Lincoln City, just off the end of 15th Avenue, and at Boiler Bay. Although it was warmer than November had been, and the skies were bright and blue, the wind still blew along the coast. (You can only be so lucky with the winter weather.) 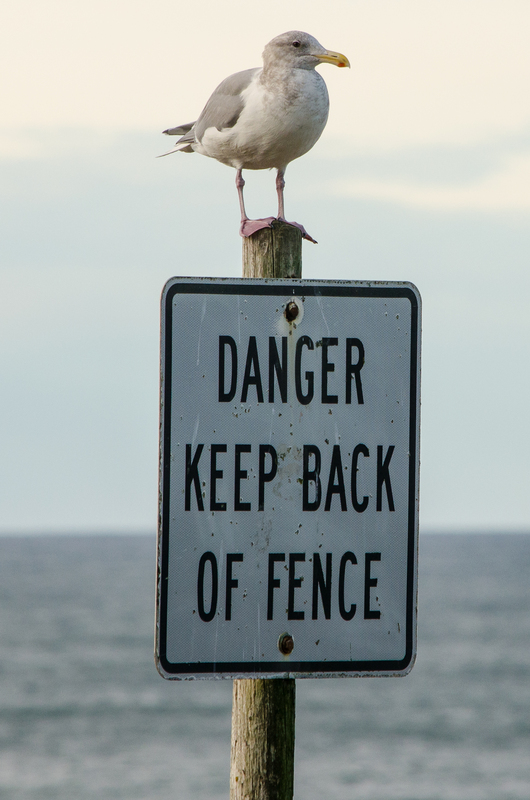 After a couple of unsuccessful stops for anything more than American crows, a variety of the more common gulls, and some European starlings, I found myself at the end of 15th Avenue after parking in a public lot on that street. The beach looked at least interesting, with only a handful of other people around and some low rocks giving a promise of minor tide pools if nothing else. 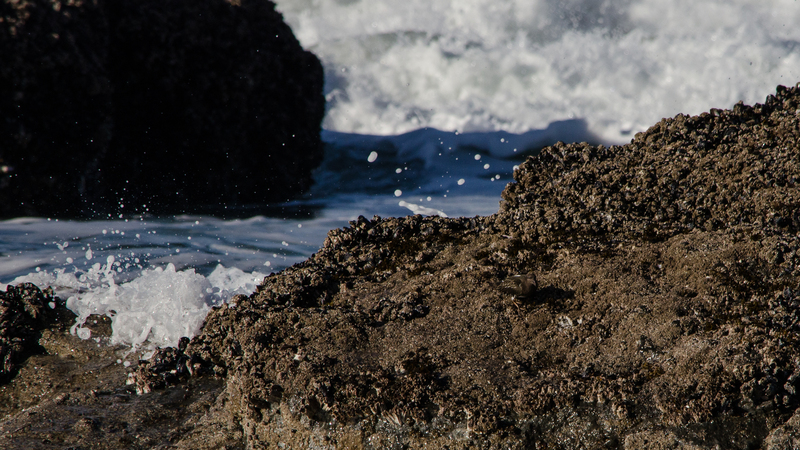 At first glance, there were just a couple of gulls hanging around on the rocks, trying to avoid the spray of the surf. Having just purchased a new weapon for my birding arsenal – a pair of Nikon Monarch 7 8×30 binoculars – I was alright with just having the big, white birds around for a little practice focusing on moving targets. It’d been a long time since I’d really used binoculars and these are certainly the nicest I’ve owned. Peering through the lenses, I have to admit it was pretty awesome to just watch the waves hit the rocks and see the highly-detailed spray up-close, without having to get drenched. But the waves weren’t all that caught my eye. 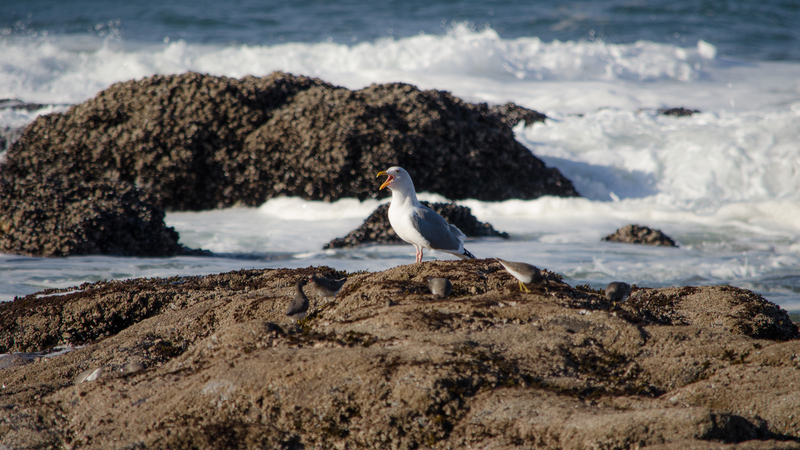 I realized something other than just the gulls was out on the rocks. It was the bright yellow legs that caught my eye, drawing my attention to the otherwise well camouflaged surfbirds. A small flock of a dozen or so was moving about, pecking at the barnacles and muscles in their search for a meal. 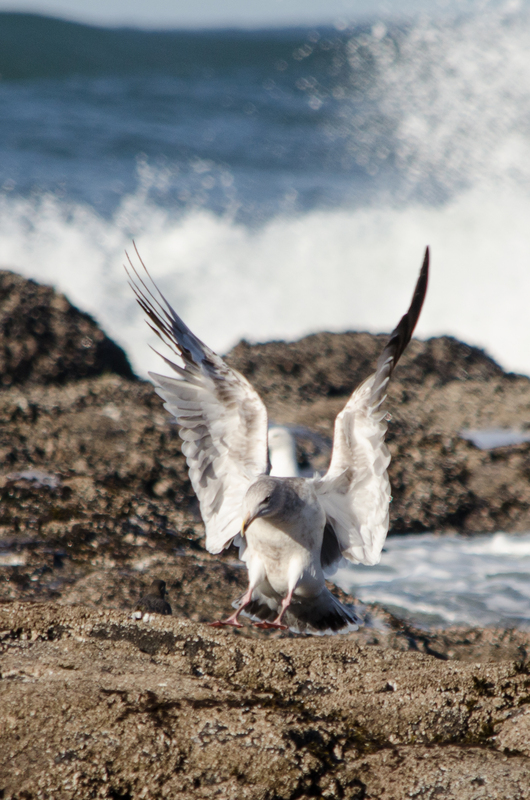 The mottled gray-brown feathers of their backs and wings blended almost perfectly into the rocks whenever they stopped, which never lasted long. As I scanned the rocks, watching these little birds moving around, a bit of familiar, incredibly bright orange appeared through my lenses. 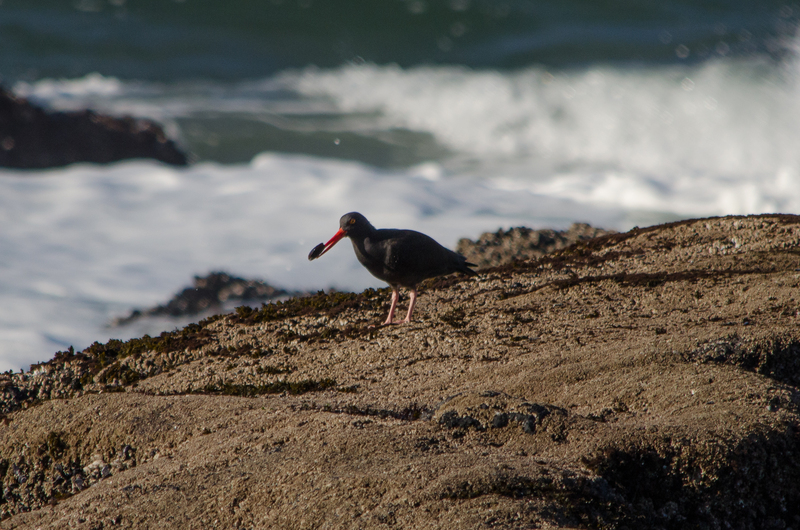 Black oystercatchers are hard to miss once you’ve spotted the crazy color of their beaks, eyes, and legs. 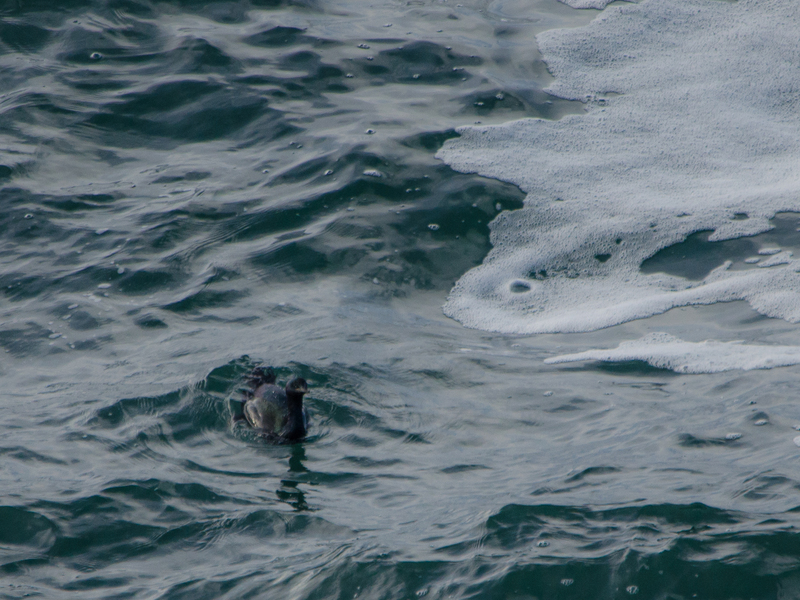 A pair of them was dodging the incoming waves as they picked at the muscles. One thing I’ve learned as a birder is that birds attract other birds, and watching one will usually lead you to another. This proved true yet again, as I found yet another well-camouflaged bird while following the oystercatchers: a black turnstone. Similar at a glance to the surfbirds, this was a loner rather than a member of a flock. The legs were orange; the back, head, and wings slightly darker than the surfbirds; the white of the breast and belly was clean, where the surfbirds were spotty. The beak on the turnstone was a bit slimmer as well. Just like the surfbirds, when the black turnstone stopped moving it blended in perfectly with its surroundings. Can you spot it in the picture below? After a break for lunch – clam chowder, in a sourdough breadbowl, because I had somehow managed to not get any seafood on my last trip to the coast – I headed south to Boiler Bay. So far, I have had something new to see each time I have stopped here. 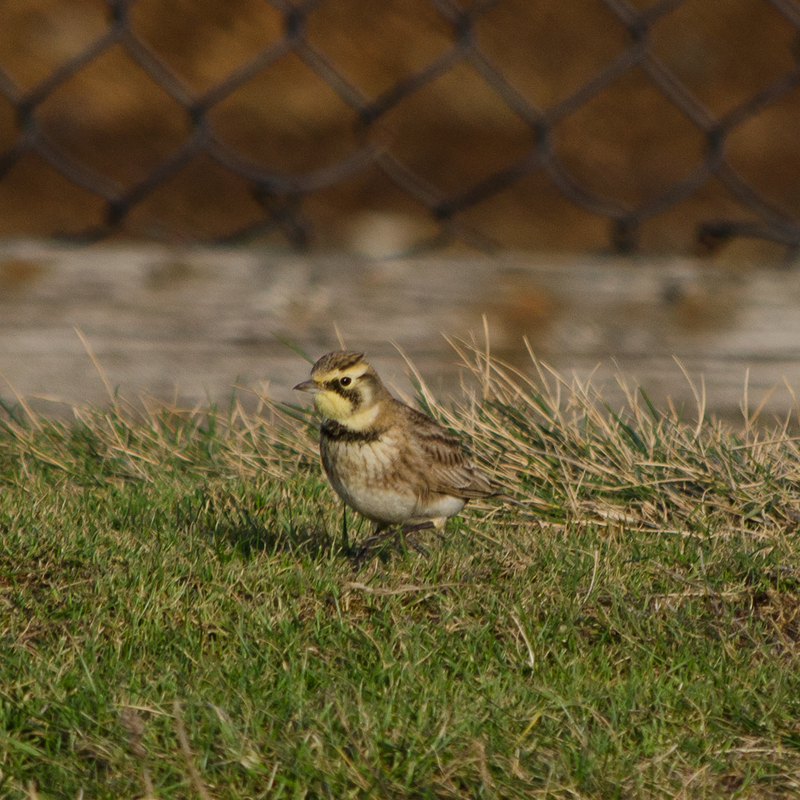 I must say I was a bit surprised, though; I was expecting more seabirds, and while I found them, the bird that most caught my attention was a horned lark. I caught just a flash of the yellow face over a small mound of grass, and could not get my camera into my hands fast enough. The markings on this little bird are very distinctive, and I recognized it immediately although this was my first in-person encounter. 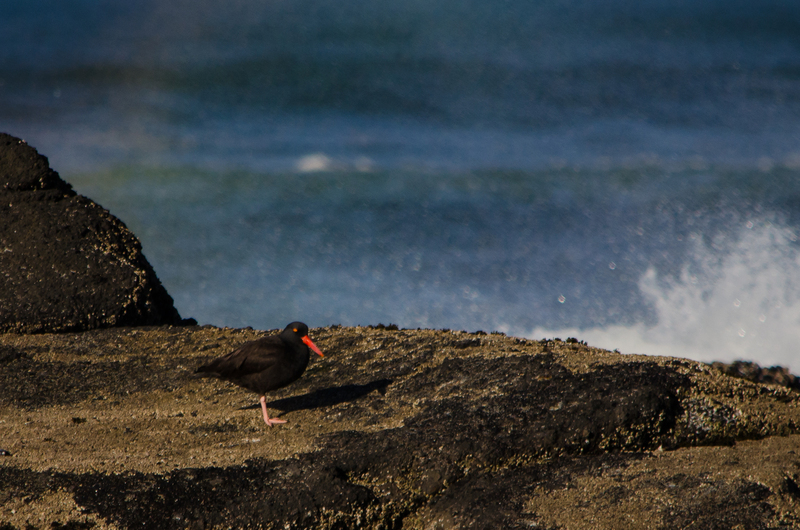 When this lone lark finally moved on, I turned my attention back out to the ocean. 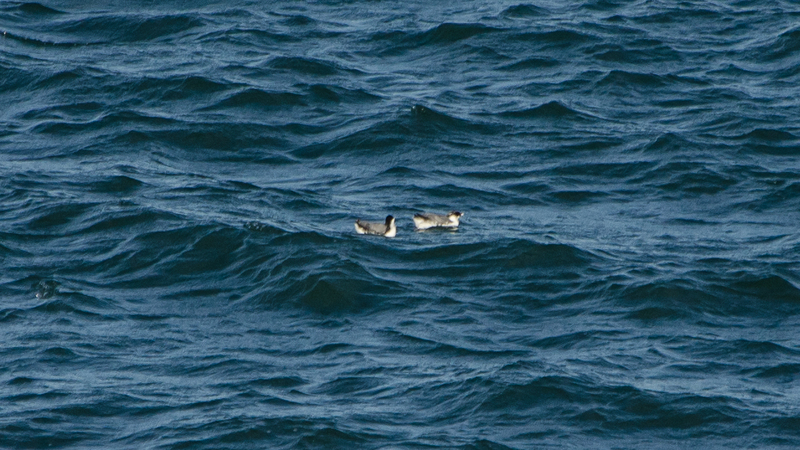 A pair of floating dots turned out to be ancient murrelets, yet another addition to my list. These little birds look sort of like a penguin swimming on the surface, floating on their bellies. The bills are light in color; their heads are dark, with their back and wings being more gray, and their necks, sides and bellies white. There were several pelagic cormorants around the bay on this day as well, both in the water and flying through the air. These all-dark birds were revealed to have a bit of an iridescent sheen I had never noticed below, when captured in a low, indirect light. Overall, this little trip added four additional birds to my count for 2014. A very successful weekend, if I do say so myself, and it wasn’t even dedicated strictly to birding! For more images from this trip and my other birding excursions, be sure to visit my Flickr site. Comments are always welcome! I love watching the Gulls. They are comical and always bring a smile. So glad you had a wonderful trip and thanks for sharing your beautiful photos! Happy Birding!